In The Winter Sun, Fanny Howe proves to be a reluctant and rebellious memoirist. At the outset of The Winter Sun, an apologia for the writing life, Fanny Howe confesses, “Since early adolescence I have wanted to live the life of a poet. What this meant to me was a life outside the law; it would include disobedience and uprootedness. I would be at liberty to observe, drift, read, travel, take notes, converse with friends, and struggle with form.” The outlaw poet has a long lineage, from the Beats and Rimbaud back to the troubadours, and it doesn’t accommodate the vulnerabilities of womankind. What it would mean for Howe, born in the United States in 1940, to pursue a life of poetry and self-definition–without sacrificing eros and motherhood–unfolds in a series of essays that might take as its motto “lower limit: memoir, upper limit: lyric.” The Winter Sun is an indispensable companion to Howe’s last book of nonfiction prose, The Wedding Dress (2003). Both collections circle around the theme of word and life, the via negativa, in an increasingly positivistic and cynical world. She subtitles The Winter Sun “Notes on a Vocation” but states at the outset that hers is “a vocation that has no name,” collapsing the mystical and the literary, Simone Weil and Samuel Beckett. The child sensitive to these intimations of cynicism and apocalypse would grow into a rebellious adult. The Wedding Dress opens with a powerful testimony of her youthful marriage and separation from her husband, Carl Senna. They were activists in Boston during the busing crisis (Jonathan Kozol introduced them). After four years of increasingly tense relations, mirrored too perfectly by the tensions outside their door, they were divorced and she, a white single mother, had three interracial children to support in a climate of fear and unrest. “There were many women like me–born into white privilege but with no financial security, given a good education but no training for survival.” This crisis, and the example of her much-loved mother-in-law, a black woman from the South, precipitated Howe’s conversion to Roman Catholicism. Howe is well aware of how highly her “invisible-faithful” Catholic values are esteemed by “materialist-skeptical” intellectuals. Bitingly she acknowledges that people like herself “annoy well-adjusted people because weakness is not meant to survive.” In pitting herself against the evo-devo celebration of competition that permeates our culture, Howe’s unorthodox Catholicism (she quotes liberation theologians) is just as countercultural today as her civil rights activism was in the 1960s. In their common concern with language and its inadequacy, the poet and the pilgrim converge: one is devoted to a vocation with no name; the other to a Being with no name. 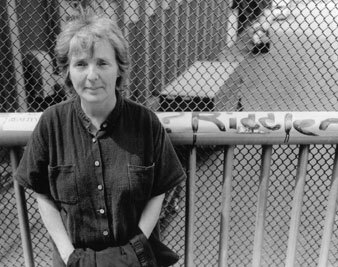 Howe retraces her life in two long essays, “Branches” and “Person, Place, and Time,” in order to understand how it was that she spent long decades at the service of poetry. She replays her fascination with Robert Lowell and Edward Dahlberg, both of whom served as mentors of sorts. (She never actually showed her poems to Lowell, and as for Dahlberg, it “ended bitterly. He chased me around his apartment on Rivington Street with his pants down, having locked the door from the inside, and I had to leap out a window to get away from him.”) She recounts stories of people who have moved her–the obscure young adult novelist Antonia White; Emily Brontë; the documentary filmmaker Henry Hampton; Simone Weil; fellow spiritual travelers like Sara Grant and Jacques Lusseyran. Between the more autobiographical and philosophical essays (lower limit: memoir) are short, poetic pieces (upper limit: lyric) like “The Message,” “America” and “The Chosen” that serve as reminders that the lyric tradition in English is intimately tied with religious questioning and longing. The experimental poet pushing beyond the limits of the sayable is the direct descendant of a poet like George Herbert, talking to God as the reader eavesdrops; or, of course, Gerard Manley Hopkins, one of the great poetic innovators. Howe does situate herself among her own generation and its history even if she ultimately aligns herself with the transcendental. Followers of her writing have found it published chiefly alongside the Marxian Language poets and the libertine New York Schoolers and other secular Modernists. Indeed, at a glance her poems look comfortable among those others, with surface values approximating disjunction, abstraction and drift. In a statement of sensibility–religious and poetic–in A Wedding Dress, Howe advocates “a complete collapse of reference and reconcilability…. It breaks open the lock of dualism (it’s this or that) and peers out into space (not this, not that).” This might be a statement from almost anyone in In the American Tree, Ron Silliman’s landmark anthology of avant-garde poetry published in 1986; but Howe’s contrarianism draws from mysticism, not post-structuralism. This is a conviction that may be grounded in Howe’s belief, with fifth-century India’s Bhartrhari, that “grammar leads to God.” She asks, “If there is no sacred text can language still be trusted to have an original gust of justice forming it, a virtuous grammar embedded in it, better meanings hidden in the white lines?” If so, believers are obliged to speak with great care: the truth of language has a supreme guarantor, and even the word “God” should be uttered with skepticism. Therefore, one does not answer questions so much as “lengthen the resonance of those questions.” Therefore, one keeps tinkering with definitions until “I realized that [belief] simply means that you are conscious of the potential for something to become new.” God, words and justice are inextricably linked. For Howe, experimental lyric is just a way to keep all avenues of communication between those terms open and bidirectional. So what are we, if we are indeed enlightened and well adjusted, supposed to make of a woman who holds incompetence as an exemplary value; who distrusts words but uses them specifically, in the age of Richard Dawkins, to trace experience back to God; who would rather “hide out” caring for children than “get to work!” à la Linda Hirshman? I find that Howe’s essays clarify two contemporary issues. One: “The atheist is no less an inquirer than a believer,” she writes. “In living at all, she is no less a believer than an unbeliever” (emphasis mine). Hence Camus’s opening sentence in The Myth of Sisyphus, from 1942, is as pertinent as ever: “There is only one really serious philosophical problem, and that is suicide.” We must determine for ourselves a raison d’être; in this, as in everything else about Darwinian capitalism, we are on our own. (Howe reminds us that the sign over the gate to Buchenwald reads Jedem das Seine–“to each his own,” or, as she clarifies, everyone gets what he deserves.) In rejecting suicide, we are all creatures of faith. Determining for ourselves a raison d’être is also, of course, the chief prerogative of those who choose the writing life, and the second issue Howe’s “Notes on a Vocation” clarifies is the role of the poet in an age of widespread scientism that peremptorily decides what questions are worth asking and how best to answer them. Quoting Johann Metz again, Howe advocates “rebellion against being partially described–be it by a science or by another person.” A poet–just by persisting in that weak, useless, embarrassing role–contests authoritarian definitions of the self. Until the suave proponents of Darwinian fitness and success can solve the problem of “living at all”; until such time as they can make us–mothers, fathers, children, poets–happy to be partially described, governed by those descriptions, we cannot do without Fanny Howe and this nameless, wide-open vocation.